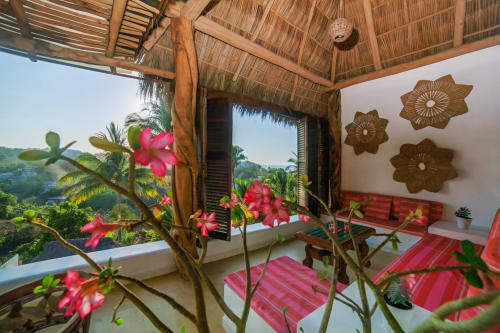 Villa Tranquila in Sayulita is a 2100 sq. ft. Premium Plus 1 bedroom one bath Villa located in the boutique hotel Villa Amor. 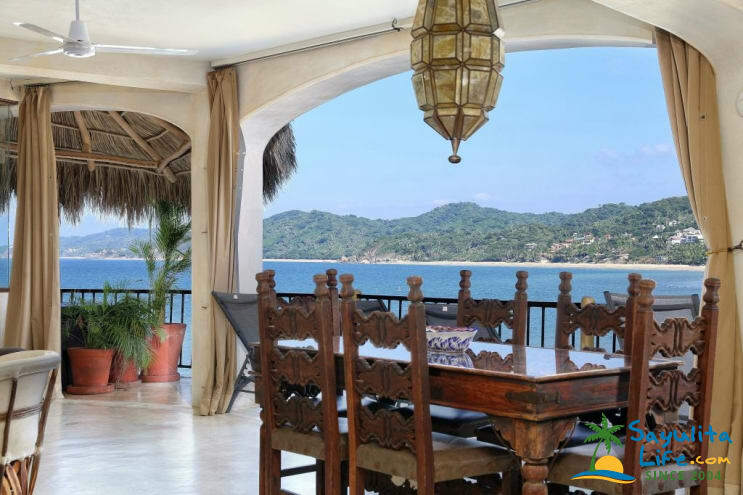 This Villa has unobstructed views from living areas, bedroom and a full, private patio. This Villa has full access to Villa Amor ammenities including an infinity edge pool, private outdoor seating and gardens, daily yoga and the infamous Si Senior restaurant. This Villa is located on the third floor of the newer building. This Villa also has a second bedroom option. With beautiful decor and covered, open air design for enjoying the tropical lifestyle. 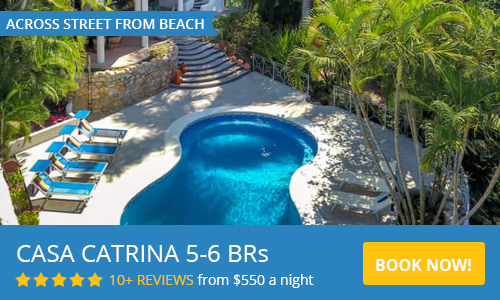 You will enjoy the specious terrace with lounge chairs, where you can enjoy the ocean breeze and sound of the waves crashing below, and gorgeous views from the kitchen and living areas. As you enter the Villa proper, the expansive Pacific Ocean will take your breath away. Underneath the wide ceilings and beautiful antique lamps, the villa is tastefully furnished with everything you will need for the perfect vacation. VILLA TRANQUILA - 1 BEDROOM IS THE SAME VILLA AS VILLA TRANQUILA - 2 BEDROOM BUT RENTS WITHOUT THE USE OF THE CORNER BEDROOM AND JACUZZI TUB. We do own other Villas at Villa Amor so tell us what you need! This place is 10x more amazing in person than it shows in the photos. It's an absolute dream come true. The location is a 5-7 minute walk across the beach to downtown, which was perfect for us. We spent far more time in the villa than we thought because it was just so amazing to sit there and look at the view and watch what was happening on the beach. It was also super close to Playa de Los Muertos which was our favorite beach. Next time we return we'll definitely be staying here. Also -- Patti was incredibly helpful during our stay and set up everything we needed for us. All around great service. My husband and I have stayed at two of Mark’s places at Villa Amor in July 2018 and loved them both! Great location, has everything you need, and a beautiful view! We rented a golf cart, which Marks assistant (Patty) set up for us and it was there waiting for us when we arrived. You don’t really need the golf cart because town is so close but we really enjoyed having one and being able to explore farther than we would have preferred to walk. Can’t say enough good things about Villa Del Mar and Villa Tranquila. We were in awe when we walked into Villa Tranquila, it’s very spacious and beautiful! This is the perfect place to stay, more spacious than Villa Del Mar with a full sized fridge but both are fabulous! The maid service was also excellent (only Spanish speaking so brush up if you’d like to communicate with them) and both places had all of the kitchen equipment and beach items we needed. Just at the bottom of the driveway there is a place you can rent paddle boards (at the Amor Botique Hotel office) for a small fee and that was very convenient as you can walk right into the water from there. We also really enjoyed that the location was not too close to the main beach in Sayulita but perfect distance to be able to walk to that beach or to Playa de los Muertos.Just after sunset if you walk to Playa de los Muertos you will notice fire flies along the way and we really enjoyed that and made a point to see them nightly. 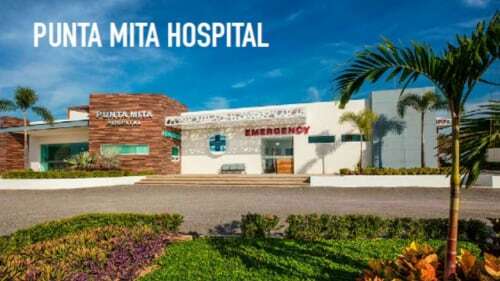 All of the people we encountered in Sayulita were very nice, we felt very safe, and the food was all excellent!We are now planning our trip back to Sayulita for March 2019 and will definitely be staying at Villa Amor! A beautiful stay for two! My boyfriend and I visited Sayulita for the first time in mid October for our friends wedding and fell in love! The town had such a friendly and laid back vibe. The hotel is conveniently located with a short walking distance from downtown and minutes to two beaches. Villa Amor property is immaculately maintained. The restaurant staff and were fantastic and helped contribute to a fantastic wedding experience. Our stay in the Villa Tranquila contributed to our exceptional experience. The villa is beautiful, spacious for a studio and had an incredible ocean side view. The suite is fully equipped with a refrigerator, beach chairs, an umbrella, and boogie boards which made the place feel like home. The chairs and umbrella were exceptionally helpful as it was very warm during our visit. Mark, Nick and Gabbi were very attentive to our stay and a pleasure to work with. I would highly recommend staying at Villa Tranqulila! Refund Policy/Cancellation: If reservations are cancelled within 45 days of your stay, a cancellation fee of one night lodging per villa booked will be charged and the remaining balance of your deposit will be refunded. If reservations are cancelled within 21 days of your stay, a cancellation fee equal to 50% of the total amount of your stay will be charged. If reservations are cancelled within 14 days of your stay for any reason including weather, transportation, medical and especially during the stated holiday period in December/January, a cancellation fee equal to 100% of the total amount of your stay will be charged. Credits for a future stay during the same year at the same rate period would be considered depending on the situation.